The 23-year-old pop star is on a European leg of her "Dangerous Woman Tour"
Ariana Grande is suspending her world tour through June 5 following the Manchester Arena attack at her concert that left 22 dead. "Due to the tragic events in Manchester the Dangerous Woman tour with Ariana Grande has been suspended until we can further assess the situation and pay our proper respects to those lost," a statement from the singer's management company reads. 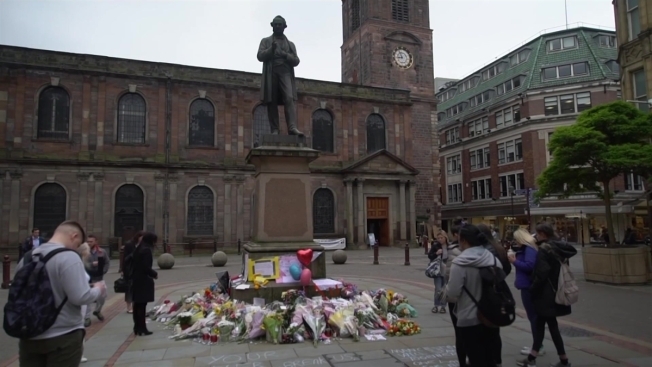 "... We ask at this time that we all continue to support the city of Manchester and all those families affected by this cowardice and senseless act of violence. Our way of life has once again been threatened but we will overcome this together. Thank you." The 23-year-old pop star is on a European leg of her "Dangerous Woman Tour" and canceled shows scheduled for Thursday and Friday at the 02 Arena in London. The suspended tour means she also will miss a May 28 stop in Antwerp, Belgium, two concerts in Lodz, Poland, and shows in Frankfurt, Germany, and Zurich, Switzerland. Grande has kept a low profile since Monday's Manchester Arena blast. She took to Twitter afterward to say she was "broken" and "i don't have words."